•	Managing Identities using Azure Active Directory. •	Implementing Advanced Virtual Networking. •	Securing Identities using Azure AD. 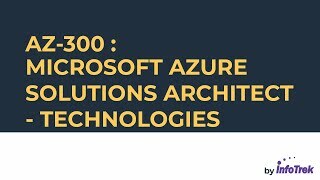 •	Understand how to Implement authentication using certificates, Azure AD, Azure AD Connect, and tokens. •	Implement Role-aBsed Access Control (RBAC) authorization. •	Implement secure data for end-to-end encryption. •	Implement secure data for implementing SSL and TLS communications. •	Use Azure Key Vault to manage cryptographic keys. •	Monitor Virtual Machines (VM)s Additionally, you will learn how to protect data using backups at regular intervals, whether by snapshot, Azure Backup, or Azure Site Recovery. •	Site-to-Site VPN Connections As well as an overview of ExpressRoute which allows companies to extend on-premises networks into the Microsoft cloud over a dedicated private connection facilitated by a connectivity provider. •	Azure Roles As well as an overview of Azure AD integration options that focuses on Azure AD Connect to integrate on-premises directories with Azure Active Directory. •	Cache-aside pattern As well as sharding patterns to divide a data store into horizontal partitions, or shards. Each shard has the same schema but holds its own distinct subset of the data. •	Virtual network–to–virtual network connectivity As well as connecting across cloud providers for failover, backup, or even migration between providers such as AWS. •	Using Swagger to document an API As well as an explanation of how Logic Apps help to build solutions that integrate apps, data, systems, and services across enterprises or organizations by automating tasks and business processes as workflows. •	Implementing resilient apps by using queues As well as, implementing code to address application events by using webhooks. Implementing a webhook gives an external resource a URL for an application. The external resource then issues an HTTP request to that URL whenever a change is made that requires the application to take an action.